The nature of the makeup of each type of foam makes each type more suitable for certain environments than the other type. For example, because closed cell spray foam can also serve as a moisture barrier it is perfect for wet areas such as basements and other under-grade locations. 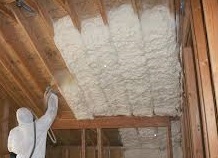 Lightweight open cell foam insulation is suitable for attics or unvented crawl spaces. It keeps flexible and soft over its lifetime. It provides insulating value many times per inch thickness what batt insulation or blown in insulation can provide. As open cell spray foam is applied, it expands to 4 times its original thickness and does a much better job of insulating than batt insulation can ever do. Other advantages of spray foam are that it doesn’t lose its loft, it doesn’t sag over time, or compress like fiberglass or blown in insulation can. Closed cell spray foam also has the inherent benefit of providing a vapor barrier and deters mold and mildew growth which are concerns in areas such as basements and crawl spaces. Spray foam is made from eco-friendly polymers that are safe for use in homes and are hypo-allergenic substances that will last longer than any other forms of insulation.